This is integral to learning and teaching baby signing to your little one. It contains 150 signs for everyday life, organised into 11 categories, including a very wide range of popular animal signs. The sheets are double-sided and laminated (to wipe away any little ‘spills’) and all come in a handy folder. 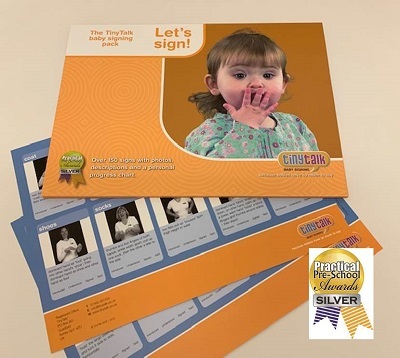 Each sign has a clear photograph, description and a space to chart your baby’s signing progress. There are also 21 ‘how to’ tips that cover areas such as when the best time is to start baby signing and why, what the best signs to start with are, who should be involved in the signing and lots of great ideas to make baby signing fun and part of your day-to-day communication. It’s essential!